You would think that the whole “be yourself” is so obvious by now that it is hardly worth saying. Yet it persists as a piece of advice. Why? Because people still don’t follow it — and I include myself in that. But I can admit and attest that when I allow myself to relax and just be myself, my social experiences and the opportunities that unfold in my life are far more positive and uplifting than when I’m trying to figure out what or who I am “supposed” to be. It’s worth noting, though, that being yourself doesn’t automatically mean everyone is going to like you and think you’re the greatest person ever to grace the earth. In my experience, however, I find I can accept those people due to the number of relationships I have that are based on authenticity. 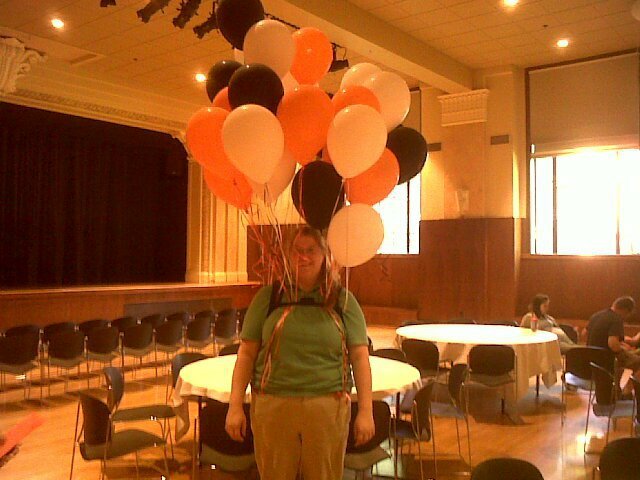 Need to carry a bunch of balloons AND carry other stuff? I got this figured out! 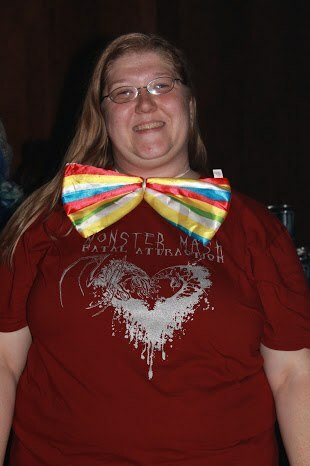 Sure, I’ll wear this silly clown bow-tie and let you take my picture! I’ll even post it on Facebook and my blog. The pictures above reflect me being me despite my initial reaction to tone it down, because people might think I’m weird or something. Who cares if I’m weird? Some of the best people in history were weird! Striving for authenticity in my relationships means that I adhere to the second piece of Stanza 5. If I don’t like someone, I’m polite and pleasant, but I don’t go overboard or agree to socialize with them in an effort to make it seem like they’re my friend. Luckily, there are very people I do not like something about so this happens rarely. The last sentiment of Stanza 5 just seems to resonate in the air when you say it. It’s along the same lines as a silver lining of every cloud and lights at ends of tunnels, but it’s so true! I take Stanza 6 to be all about accepting your aging and perceiving it as a blessing. I couldn’t agree more. For some reason, getting older has never bothered me. I’ve had to learn not to “should” myself about what I have or haven’t achieved at various age milestones, but I have very little trouble valuing the experiences that have shaped me today. Like many in their thirties, I know that life is sometimes difficult and even unfair, and I know that you often get more than one dose of garbage in life. So its important to learn from past experiences and prepare for the inevitable future. The trick, as the poem warns, is to avoid confusing preparedness with paranoia. After all, it would be a shame to miss out on something amazing, because I was too preoccupied with what might happen in some stretch of the imagination. Are you good at being yourself?